With so much buzz and shifting advice about food allergies, you may feel worried and confused: What’s the best way to safely introduce common allergenic foods? We’ve got you covered with up-to-date recommendations from two leading authorities: The American Academy of Pediatrics (AAP) and The American Academy of Allergy, Asthma & Immunology (AAAAI). Until recently, parents were advised to delay introducing highly-allergenic foods (the top 8 offenders are peanuts, eggs, fish, shellfish, soy, wheat, tree nuts, and dairy). The rationale was that holding off allowed a baby’s gastrointestinal system to mature and become less sensitive, thereby reducing the likelihood of an allergic reaction. New research, though, actually shows the opposite—that waiting to introduce these foods may increase the likelihood of developing allergies to them. So, if your baby is physically ready to start eating solid food and your pediatrician gives you the green light, the AAP encourages you to include highly-allergenic foods in your 4-6 month-old baby’s purees. Remember not to give your child honey or cow’s milk to drink, though (more on why below). If your child has a family member with food allergies, has eczema, or has had an allergic reaction or a positive allergy test, talk to your pediatrician before giving her allergenic foods. Your pediatrician may have special instructions, or want to do additional testing or an oral food challenge (doctor-led introduction of a food). Introduce highly-allergenic foods after your baby has eaten and tolerated a few other solid foods. This way you can ensure that she doesn’t have any general feeding issues, like swallowing or digesting solids. Introduce new foods one at a time and wait 3-5 days in-between. If your child has an allergic reaction, this allows you to easily pinpoint the culprit. In some cases, food allergies or sensitivities show up while a baby is breastfeeding. This is because proteins in food you eat are passed to your baby through your breastmilk. 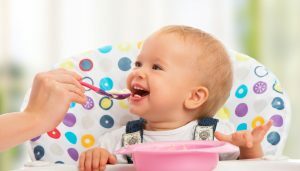 If your pediatrician suspects food allergies in your breastfeeding baby, he or she may recommend that you keep a food diary to see if there is a connection between symptoms and certain foods you eat. You may also be advised to cut certain foods out of your diet to rule them out as culprits. Within 2-4 weeks, proteins from possible offenders will disappear from your breastmilk and, if food allergies are the issue, your baby’s symptoms should disappear. If your formula-fed baby exhibits signs of food allergies or sensitivities, you may be advised to switch to a different type of formula to see if symptoms disappear. While giving your little one dairy (like yogurt and cheese) is okay, you should wait until she’s 1 to give her cow’s milk to drink. This is not an allergy issue, but a nutritional one; babies 0-12 months old should drink only breastmilk or formula to ensure they’re getting enough of certain vitamins and minerals that cow’s milk does not provide. Another recommendation that isn’t related to allergies is that you wait until your baby is 1 to give her honey. Honey may contain bacteria that can cause serious illness in infants. A food allergy should be diagnosed by a medical professional. Babies can have a negative reaction to food for many reasons unrelated to allergies. You may avoid certain foods thinking your baby is allergic to them, when in fact it could be another issue and avoidance may not be necessary. For more general information about feeding your baby her first foods, head over here.